A mere eighteen months after the well-received Enslaved, Soulfly are back with a new lineup and a new album, the band's ninth rather incredibly. Featuring Tony Campos (ex-Ministry, ex-Possessed) and sons Zyon and Igor Jr on drums and vocals, Max Cavalera keeps it in the family and largely sticks to the Soulfly template. Zyon's appearance especially is interesting if you're a long-term fan of Cavalera's works; not just for his performance, which is pretty darn good, but Sepultura's Refuse/Resist opened with his in utero heartbeat! Time flies, and the unkind could argue that Soulfly's once fresh-faced attempt to bring world music and metal together hasn't aged well; it's certainly interesting that as Max has become more influenced by extreme metal he's dropped the world music elements to the point where Soulfly is very nearly completely free of them. This may make it more acceptable to die-hard metalheads, but it does make for a less original sound and style, and although the general sound and typically recognisable Marc Rizzo guitarwork, the Soulfly of today sounds quite different to that of ten years ago. The guest spots are a disappointment, too. Aside from Igor Cavalera Jr on Bloodshed, as mentioned, we get Jamie Hanks (I Declare War) adding growls to Fallen, Mitch Harris of Napalm Death on KCS, and Clutch's Neil Fallon on Ayatollah of Rock 'n' Rolla, and although Hanks and Harris do a good enough job they fit in so smoothly that it seems ultimately rather pointless, and you have to wonder why Harris was chosen when Barney has a more distinct voice and would have marked the song out better. It's being harsh on KCS, which is definitely one of the better songs on the album, but only in comparison to the dullness that surrounds it. Neil Fallon is sorely misused, too; why would you get an appearance from one of modern rock's finest voices and then mostly use him in a speaking role? Ayatollah of Rock 'n' Rolla itself comes over as an inferior version of Rise of the Fallen, Fallon's few singing lines elevating it slightly but his blink-and-you'll-miss-it appearance bizarre given how much Greg Puciato dominated the older song, and at the length it is simply unnecessary. That sense that Max is repeating himself keeps popping up on the rest of the album. Master of Savagery and This is Violence have a suitably intense performance from Max, but the riffs feel absolutely autopilot, and Spiral as the worst offender has the sort of guitar squeals that I thought Soulfly had given up on years ago, not to mention a very dull groove that drags on and on. The Portugeuse/Spanish El Comogente is interesting at first, taking a slower pace more effectively and coming over as a slowed down Brujeria track with Tony Campos providing vocals (he's not bad at all!). Yet, again, it drags on, adding an acoustic interlude, ending up at over eight minutes long... 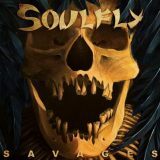 It says a lot that when comparing this to Omen, Soulfly's last album that I found slightly disappointing, Savages comes off worst, having longer, duller songs with fewer hooks and less bite to it. Pained to say it, but savagery shouldn't be quite so boring.